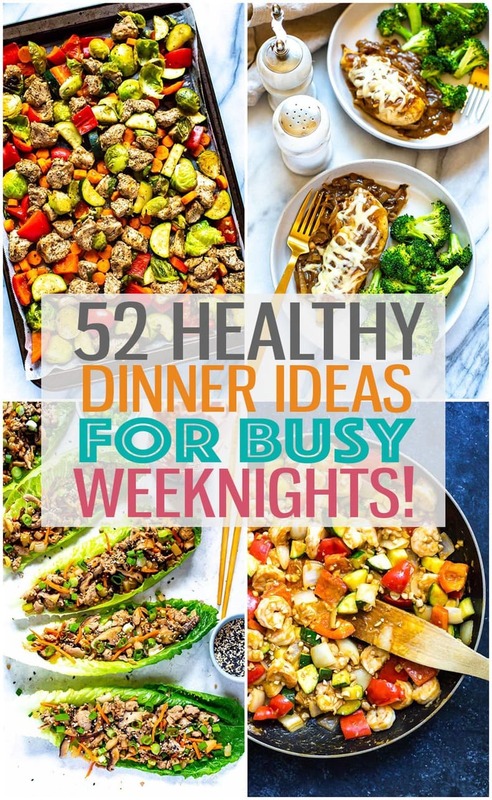 These 52 Healthy, Quick & Easy Dinner Ideas for Busy Weeknights will show you how to cook quickly and efficiently while still eating clean – learn these strategies to get dinner on the table FAST! Dinner is one of the toughest meals of the day. I don't know about you but it's also my favorite meal of the day: the one where you finally get to sit down and relax and just enjoy (ideally, anyway) a delicious, hot meal. You get to savour dinner in a way that you don't always get to with breakfast or lunch. It's that time you sit down with family, slow down a little bit and just reflect on the day. So how do you choose a healthy dinner meal plan for the week that allows you to accomplish this? Here are some of my tips and tricks to making healthy dinner recipes that are also quick and easy! Knowing what to make for dinner is probably the toughest part of dinner itself. Either you don't know what you're craving or you're worried it's going to take too long. Well, never fret with these strategies! Pick recipes that have ingredients you already have on hand at home – this way you reduce waste. Have a ton of carrots? Look up carrot recipes! Want to do something with that chicken laying on the counter? Maybe look up some chicken pasta or casserole recipes. 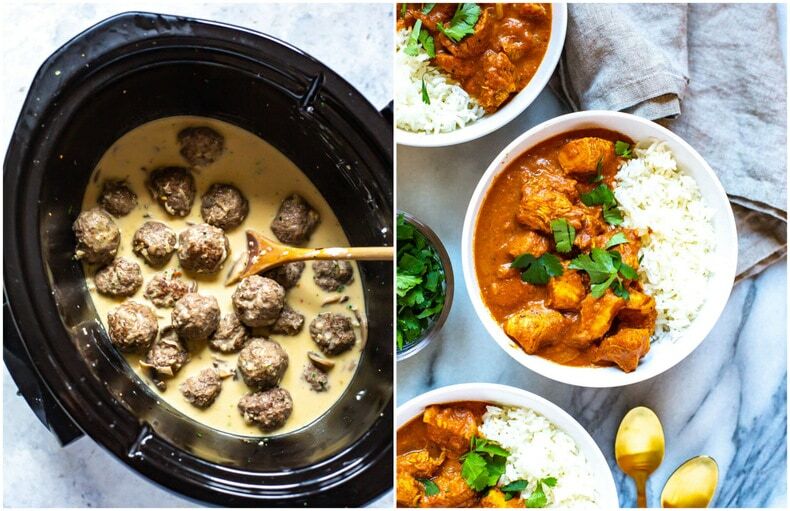 Use Pinterest to discover last-minute recipes and hone in on your cravings. You can use it as both a visual search engine or just browse your home feed for inspiration! Keep a list of all your usual go-to dinner recipes for easy access when you're running out of inspiration. This way you know you'll get to eat something you like, but don't have to think too much about what that is. Use Instagram and search specific hashtags like #lowcarb #broccoli or #groundbeef or even just #recipes to find new Instagram accounts and browse their recipes for ideas. 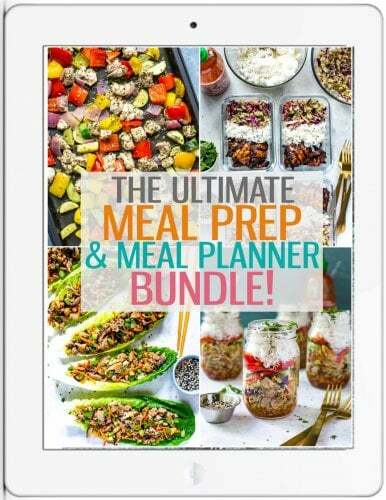 I think meal planning is really the only way to go when you're trying to keep on track with dinner ideas. I will usually fill in 5-6 days' worth of meals in a meal planner and account for my schedule that week when planning everything out. 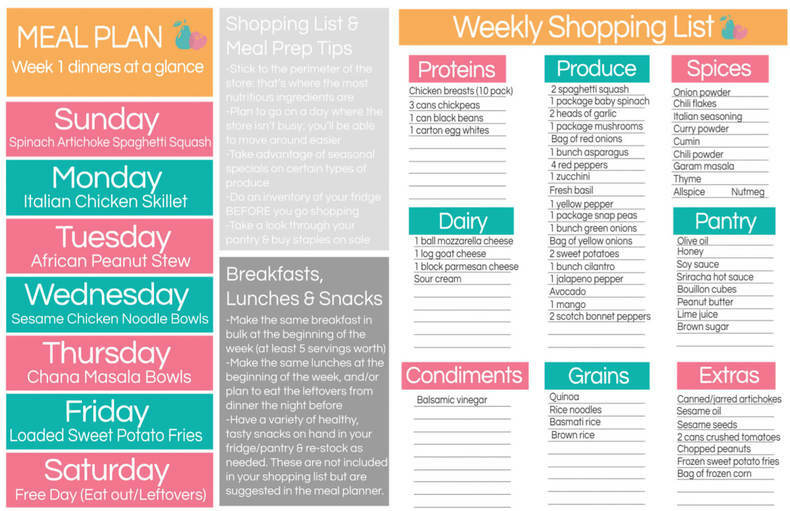 You can use some of the dinner prep strategies above when making out your meal plan for the week ahead. Having everything on paper helps you stay on track! And if you need some help coming up with ideas in general, be sure to check out my Start Here page to learn how to best use my blog to help with meal prep! 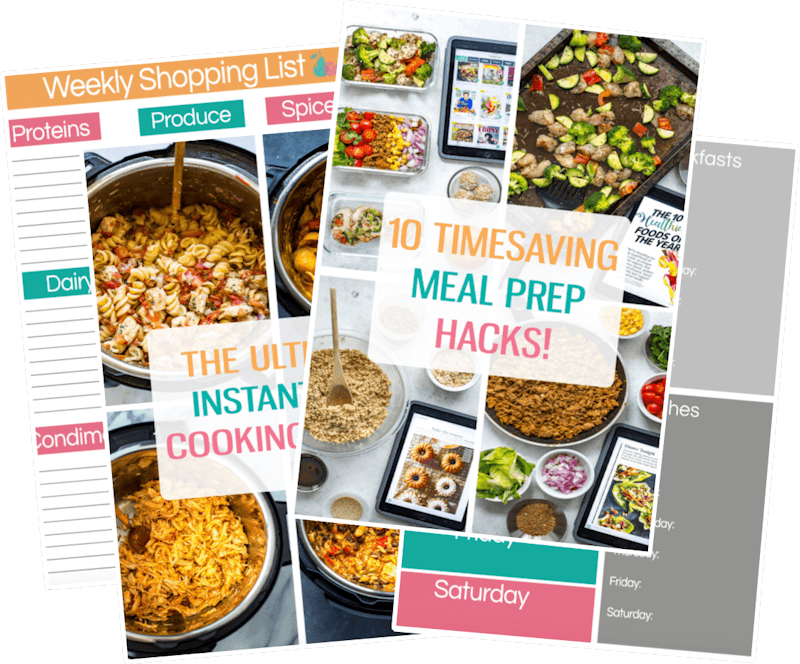 If you're looking for a meal planner template to help with dinner, you should sign up for my 5-day meal prep challenge below – you'll get a planner and shopping list template (like the one above) for free during the challenge! What makes these easy dinner recipes so easy?! While dinner is one of the most important meals of the day, it can be so hard to plan for, or it's difficult to come up with different meals every week to enjoy that keep you on your toes. It's easy to fall into the routine of making the same meals over and over again, or you just don't have time at the end of the day to spend an hour cooking after work. 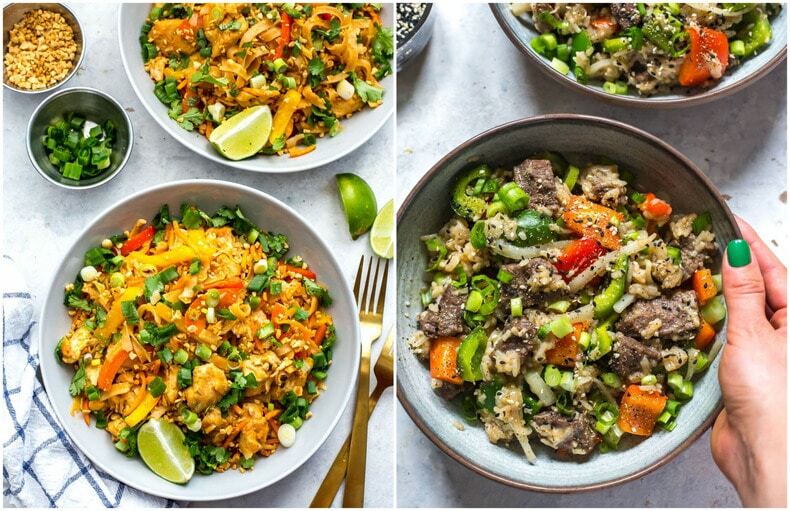 Whatever your struggle is, hopefully this post will help you choose some exciting new dinner recipes, or at the very least help you prep ahead so that dinner is less of a burden and you can skip getting takeout at the end of the workday. 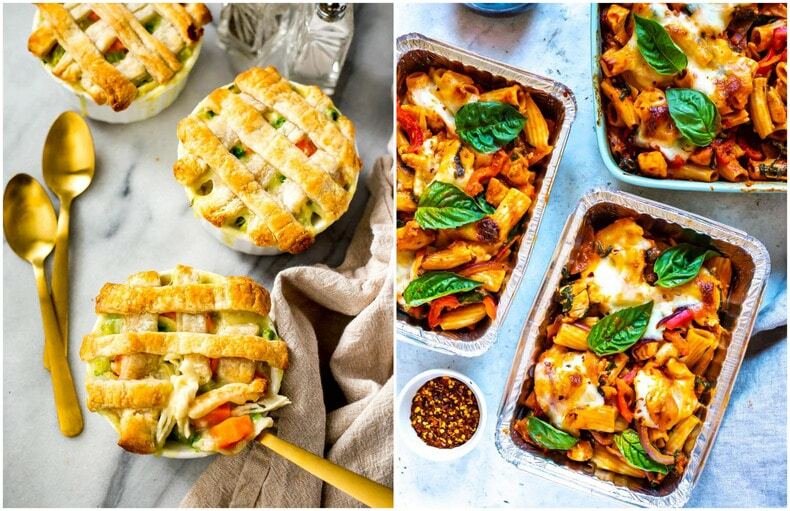 You'll find each of the below recipes categorized so that they are easy to choose from and they all employ the best strategies to get dinner on the table quickly – or will at least help you plan ahead a little bit. Now that you have an idea of how to make quick and easy meals, how do you ensure that those dinner ideas are healthy? Well, typically healthy dinners will be between 300-500 calories, relatively low in fat, sugar, sodium, and high in protein. 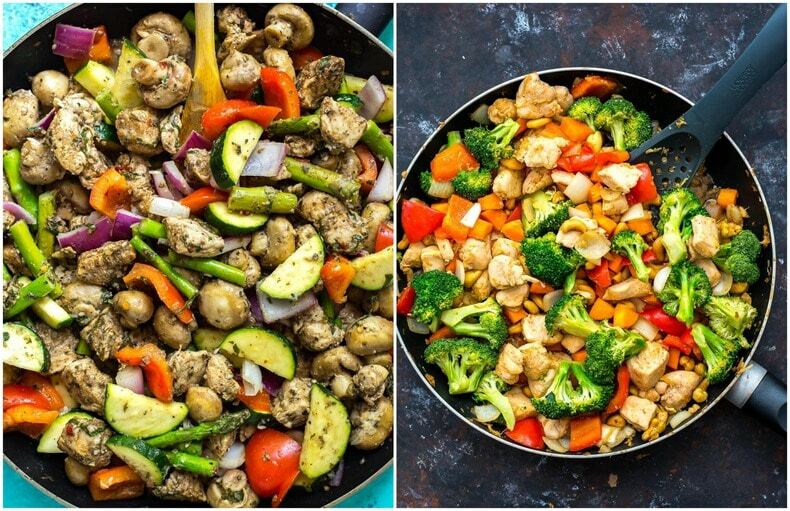 Most of the dinner recipes listed throughout this post fit these guidelines, and use whole foods, so you won't have to guess if you're eating clean. One of the best ways to cut back on the time you spend on making dinner is to limit the number of ingredients needed to make the meal. Below are some delicious dinner recipes with 10-ingredients or less. Most of the dishes below are low carb options too since grains take the longest to prepare and cook besides proteins. 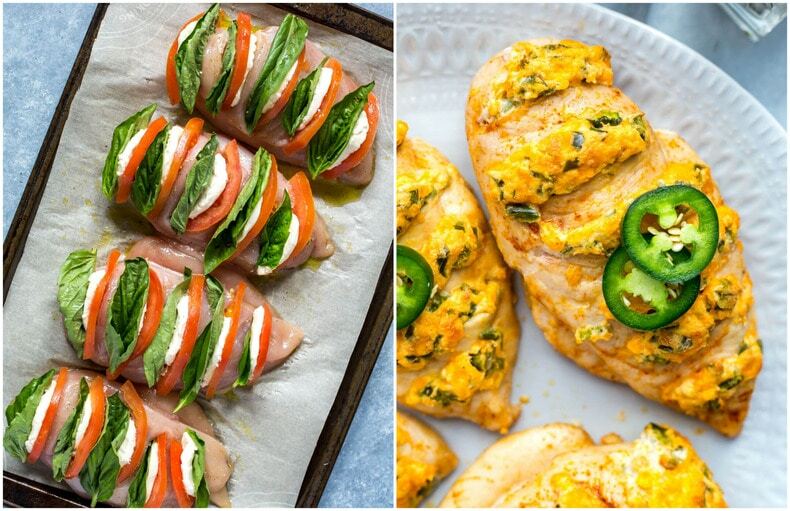 I love stuffed chicken with veggies like the caprese chicken and jalapeno popper chicken breasts shown below. You basically just cut some slits in the chicken hasselback-style, or you can open up the fold of the breast and stuff with toppings. Grill or bake, and you've got dinner ready in under half an hour! You can always serve with a side of potatoes, rice or salad to boot. Just as you can stuff chicken to keep the ingredient count low, you can also use vegetables as the vessels for stuffing. Add some chicken and quinoa to portobello mushrooms, or saute some ground beef and add to poblano peppers like the ones shown below. Adding everything to a skillet and choosing a simple sauce as with the sausage, peppers and onions recipe below also allows you to use less ingredients while keeping cook time to a minimum. 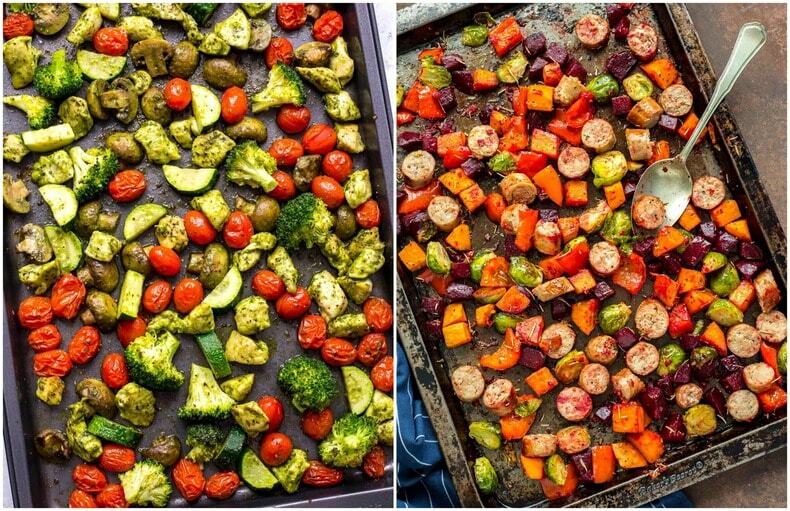 When I want to eat a quick, healthy dinner, sheet pan recipes are my go-to. 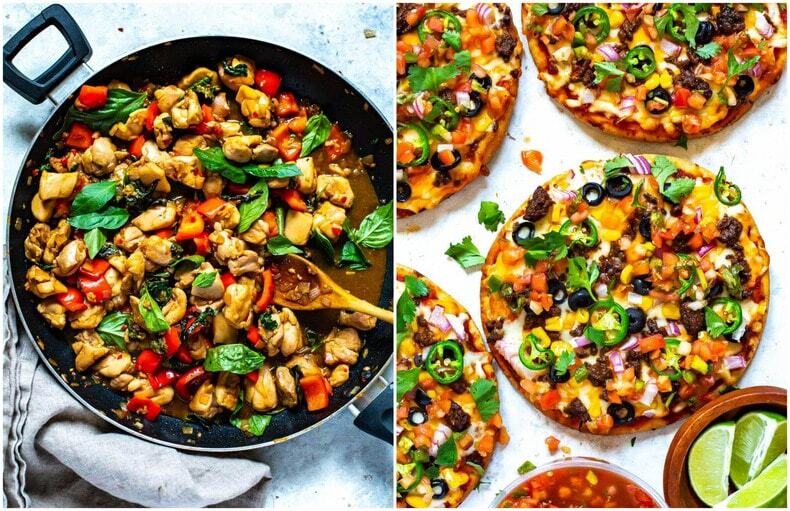 They are usually a no-brainer in terms of eating healthy because you can throw all your ingredients on the one pan, then bake and go. 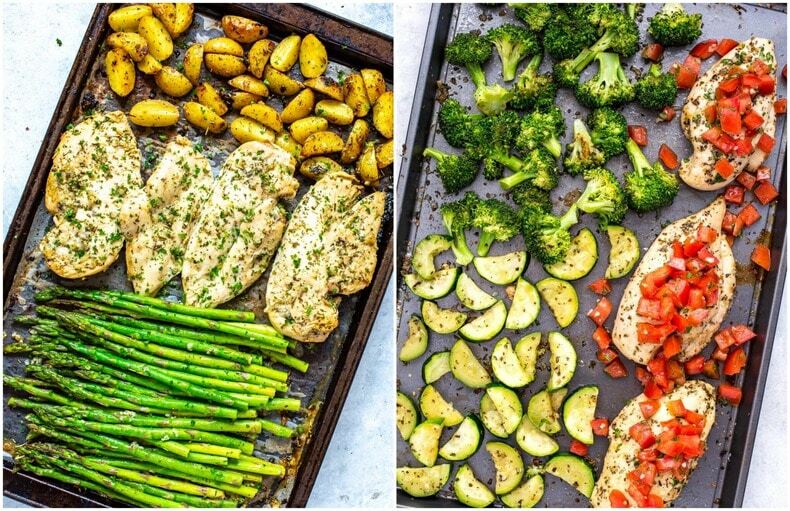 Sheet pan meals are the easiest way to combine lean proteins like chicken and shrimp with all kinds of veggies and healthier starches like sweet potato. You basically toss all your ingredients in a simple sauce, marinade or seasoning blend, bake for 20-25 minutes and dinner is on the table in no time. There's also limited mess so you don't have to worry about a ton of clean up. You also don't have to worry about food waste because you can easily clean out your veggie crisper and toss whatever is about to go bad on the baking sheet. 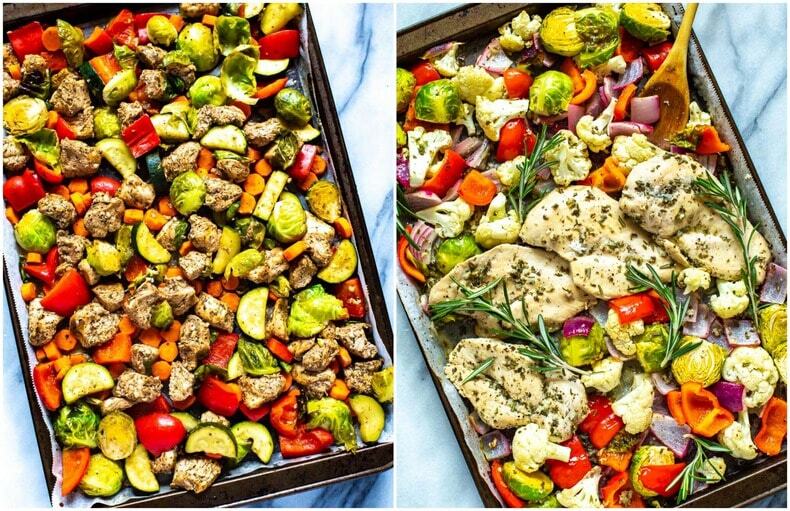 Just as long as you add a killer seasoning, you'll love sheet pan meals – the combinations really are endless. 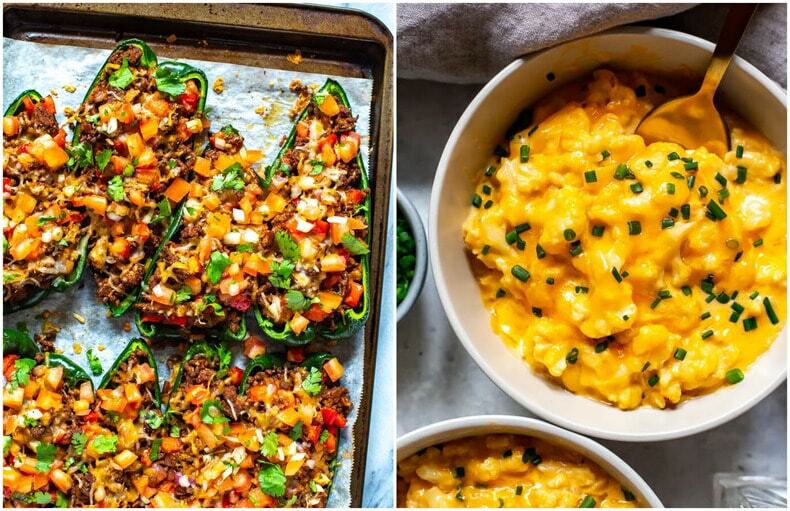 Here are some of my fave sheet pan recipes below to get you started – they make such great dinner ideas! I've also got a super handy round up of more sheet pan dinners right here on the blog if you'd like to check out more of them. 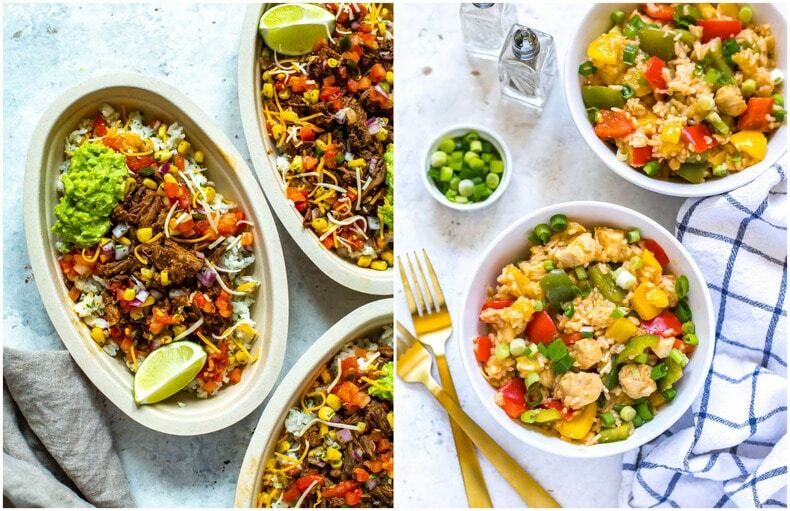 If you're looking for a more specific guide on how to get started with dinner, check out my FREE 5-day meal prep challenge below – it's a step-by-step mini course sent to your inbox over five days! 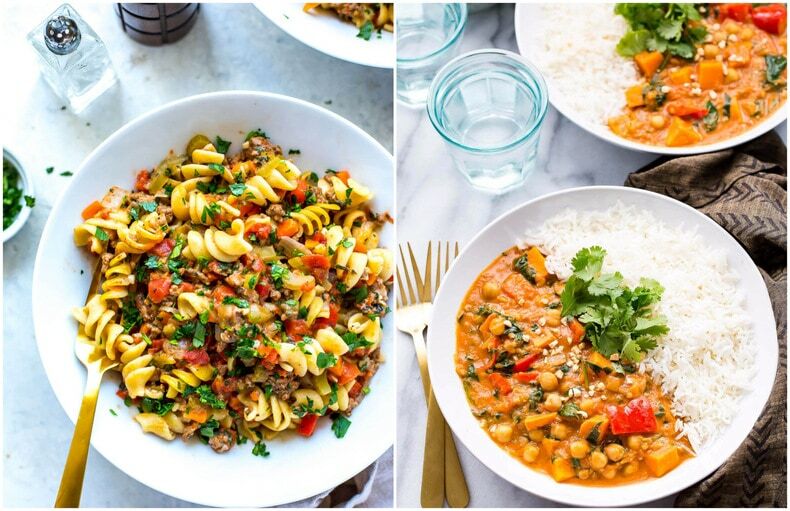 Making dinner in one pot is a great way to minimize your cooking time, and most of the pasta recipes below do just that! 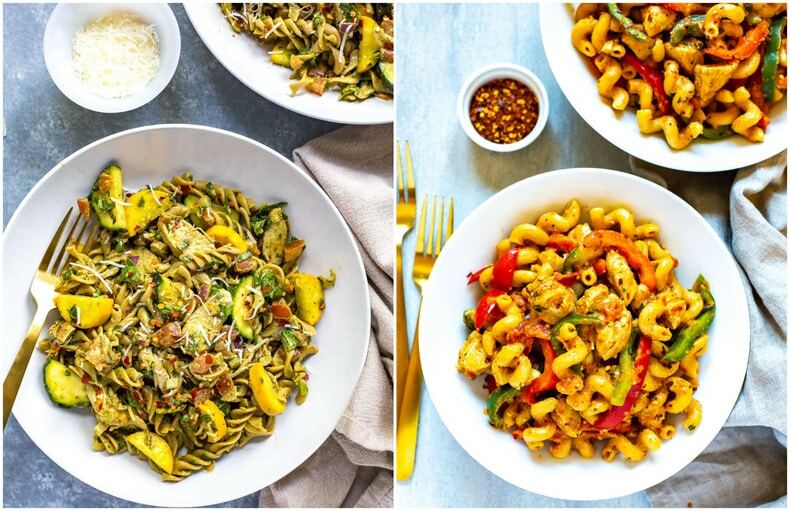 Pasta is just an overall great dinner idea because you get in your protein, carbs and veggies all in one meal as opposed to having to make separate side dishes. 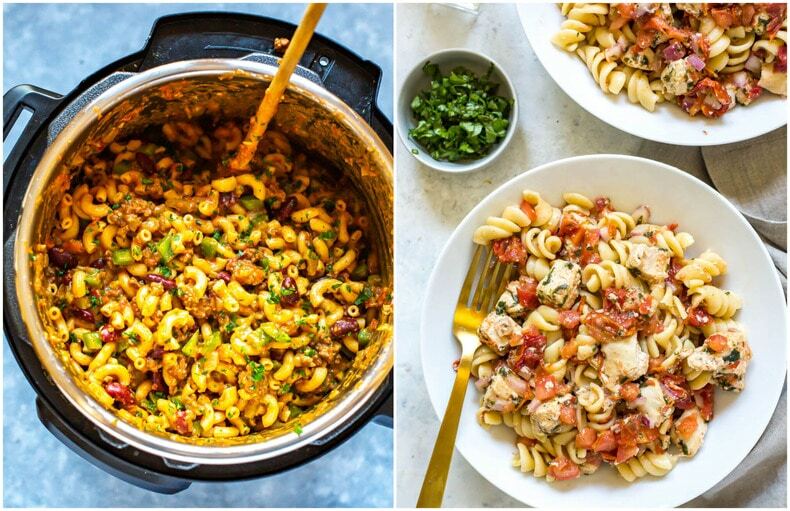 But you can also make pasta in one pot! When you do it this method, the pasta soaks up all the broth or water that you pour in among the other toppings, so there's no need to drain the pasta or make a giant mess. I've included some Instant Pot pastas below but don't fret, they can be made just as easily in a pot on the stove. All you have to do is saute the meat and veggies first, then cook on med-high for 10-15 minutes once the pasta and liquid is added. 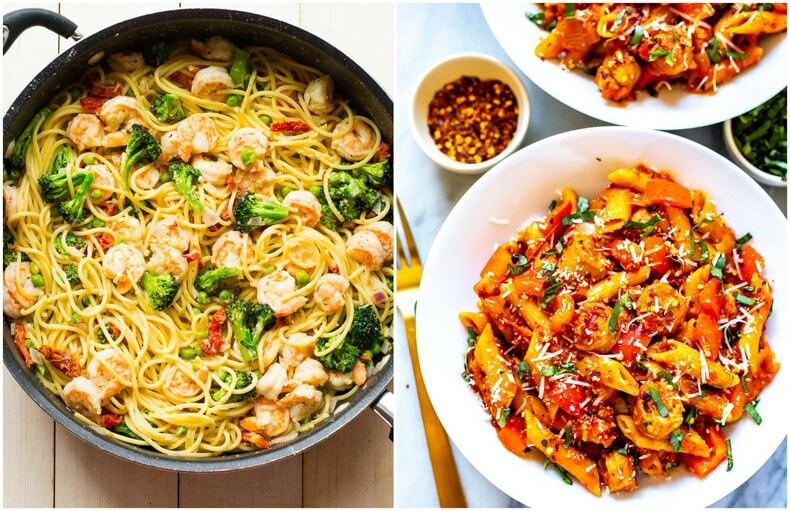 Check out my fave pasta recipes for dinner below! Speaking of one pot recipes, stir fries and skillet dinners are similar concepts but don't involve pasta. Again, you're taking a bunch of protein, sometimes a starch and lots of veggies and adding a sauce to make dinner in less than 30 minutes. I like to buy some pre-chopped veggies or pre-marinated chicken, beef or shrimp to save on prep time and then I just saute everything up! 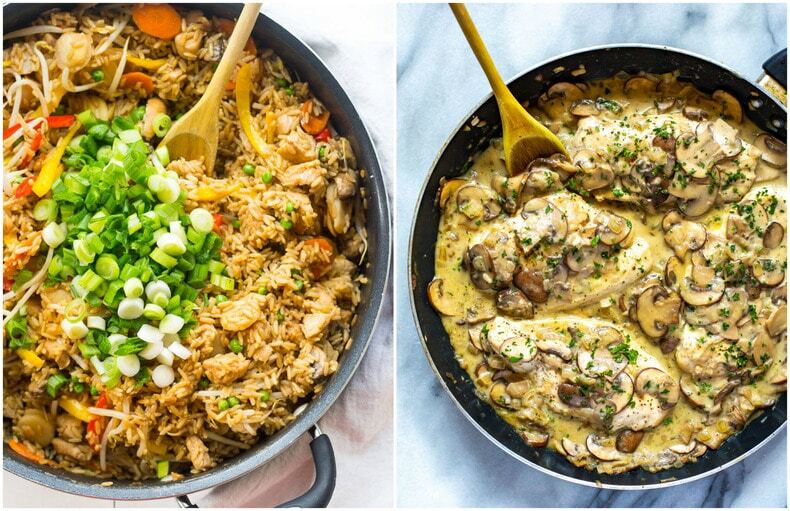 I've listed some low carb dishes below where you have the option to cook the rice separately, and I've also got some chicken teriyaki bowls where the rice cooks alongside the chicken and veggies. These easy dinners come together in a flash! And if you're looking for more skillet meals be sure to check out this other skillet recipes post with more ideas! 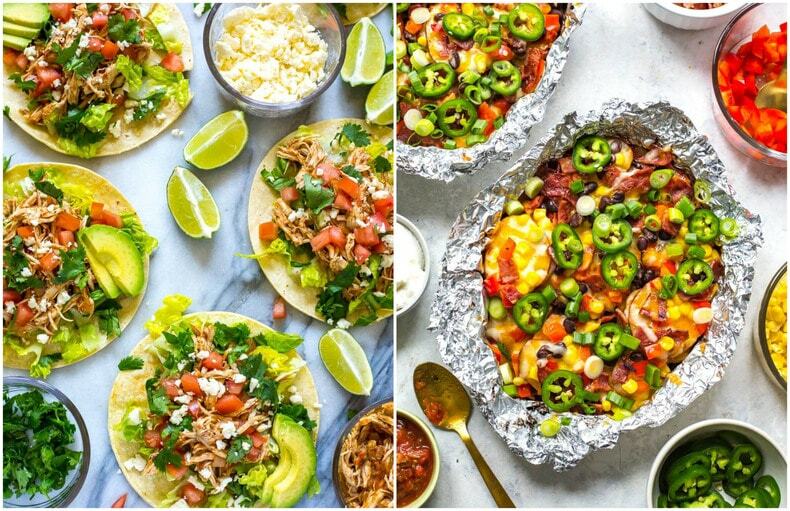 Mix and match dinner ideas are mainly the kinds of dinner where you use up whatever you have lying around in the fridge to make recipes that are more throw-together than pre-planned. Things like buddha bowls, burritos, tacos, salads, lettuce wraps, burgers, loaded fries, healthy nachos, etc. are great starting points for last-minute dinner ideas. All you need to do is look at what you have on hand, use a healthy lean protein, then take it from there! 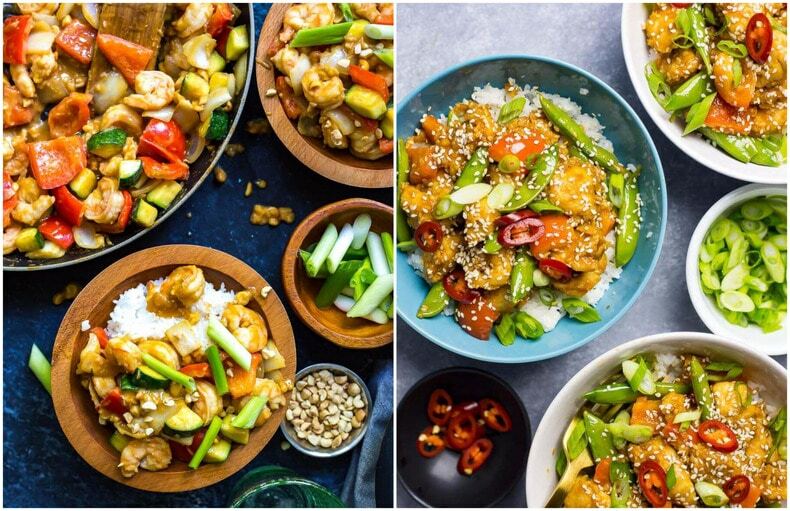 The below recipes are super versatile examples of mix and match dinners. 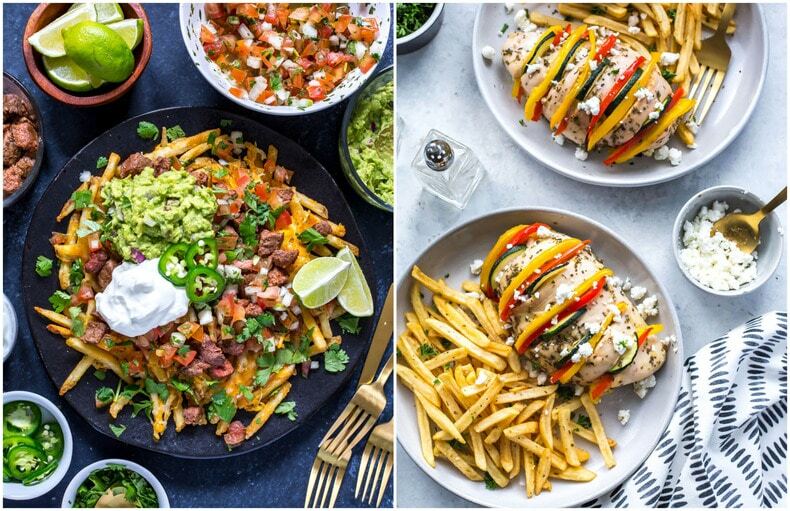 The tequila lime chicken and hasselback Greek chicken use up veggies like tomatoes, bell peppers and simple sauces made from ingredients you likely already have in your pantry at home, while the taco pita pizza and lettuce wraps are great examples of starting with a simple vessel and adding in more ingredients from there. You can also change up the ingredients and toppings you use for these recipes to account for what you already have on hand at home. Don't have any ground chicken for the lettuce wraps? Use regular chicken breast or ground beef! Don't have steak for the carne asada fries? Again, use a different protein! Even just a can of black beans will do. Or you can sub in frozen fries for fresh fries. These recipes are so easy to change up and adjust to what you already have. Another great dinner idea is to rely on freezer meals. 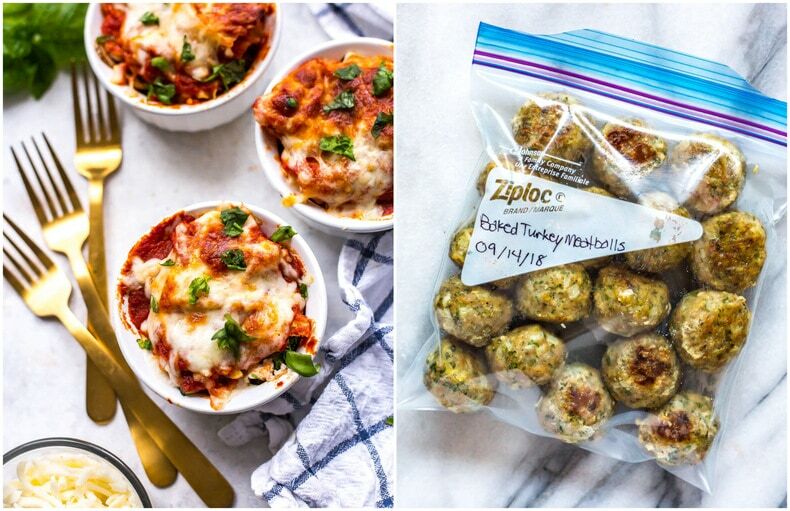 Whether it's a dinner recipe you've made already and frozen, or just some large Ziploc bags full of frozen ingredients and sauces, freezer-friendly recipes can take a lot of stress off of dinnertime! I usually make something like pasta or a protein-rich soup or stew ahead of time and freeze in small glass containers. From there you can reheat in the microwave for 7-8 minutes, stirring halfway through. However, you can also dump a bunch of ingredients like chicken and freezer-friendly veggies (think carrots, broccoli, green beans, cauliflower, etc.) into a bag along with a sauce or marinade to throw in a crockpot or pot on the stove later. I also love to make meatballs in advance – you can freeze them raw or after baking, and they make great additions to an easy dinner. 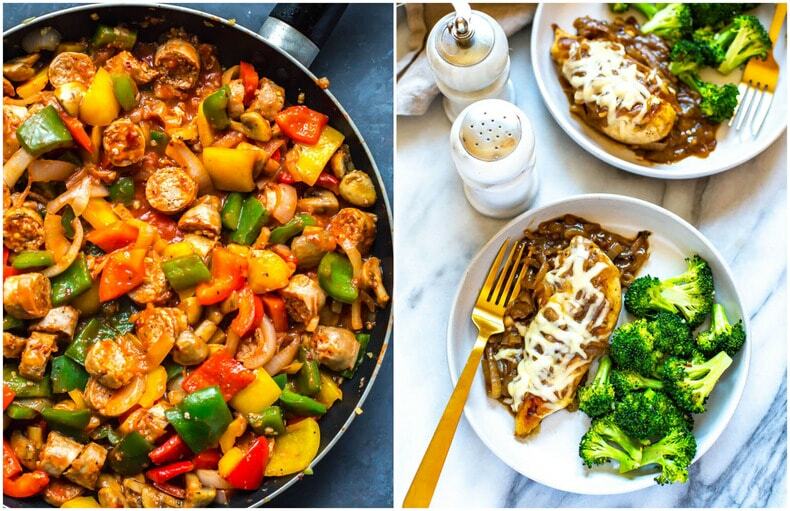 See my fave freezer meals linked below to make the best use of this dinner strategy! Have dinner cooking in your crockpot all day for the EASIEST dinner ever! You can usually prep this the night before and have it cook overnight or while you're at work. Usually all you have to do with crockpot meals is assemble the ingredients and dump into your slow cooker. The meal will cook on low for 8 hours and then most of the legwork is already done for you. Add in fresh veggies at the last minute if you'd like and dinner is on the table in a flash! 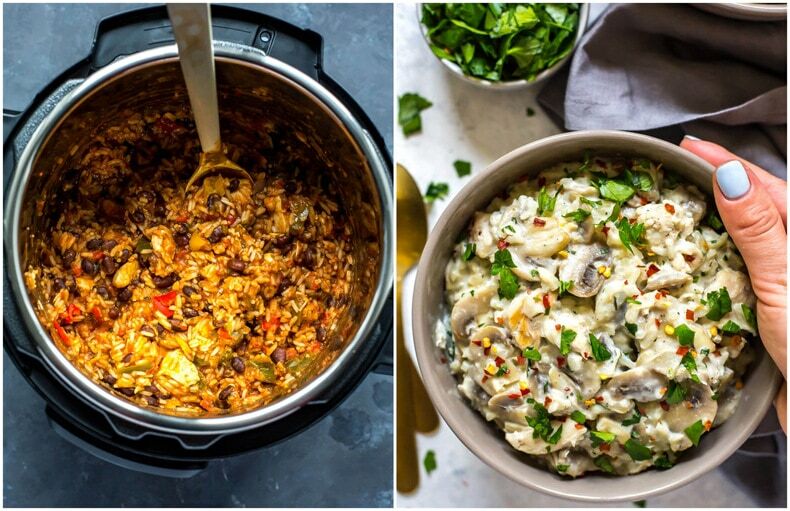 Whip up dinner using your Instant Pot – like the slow cooker, it's mostly a hands-off cooking process. Dump everything in and cook on high pressure. The main difference? 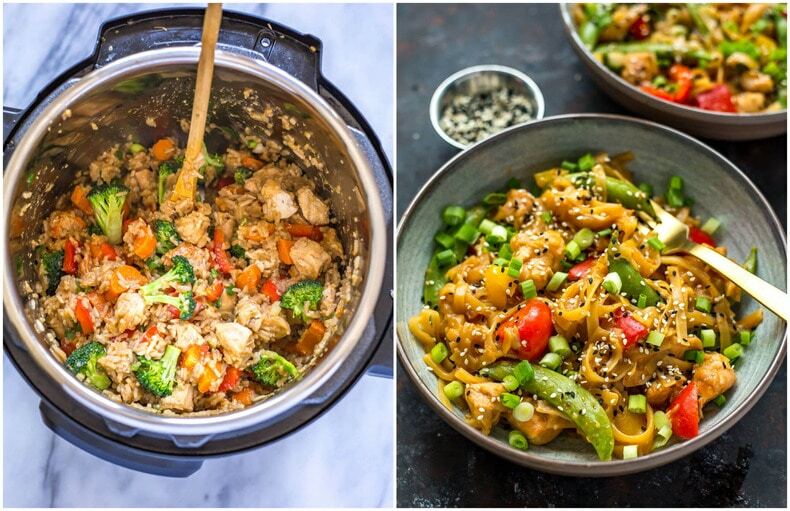 The Instant Pot cooks everything FAST! 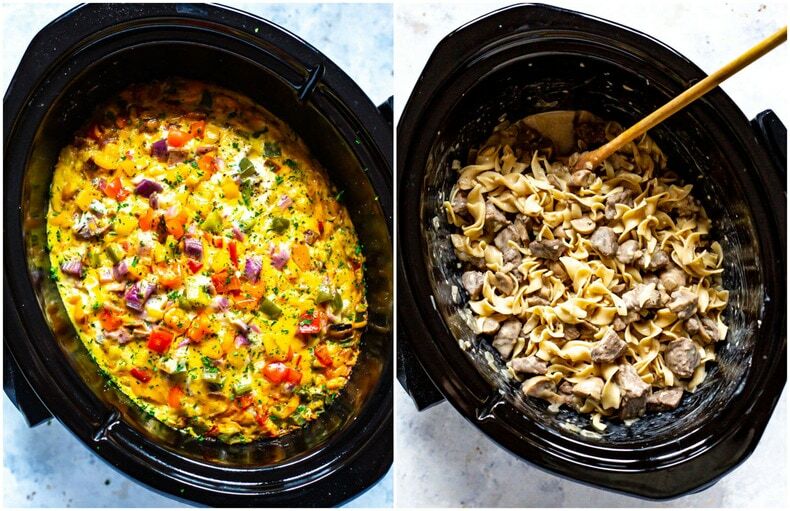 You're looking at a 20-30 minute cook time from preheating to releasing the pressure, and everything comes together in one pot to minimize clean up. 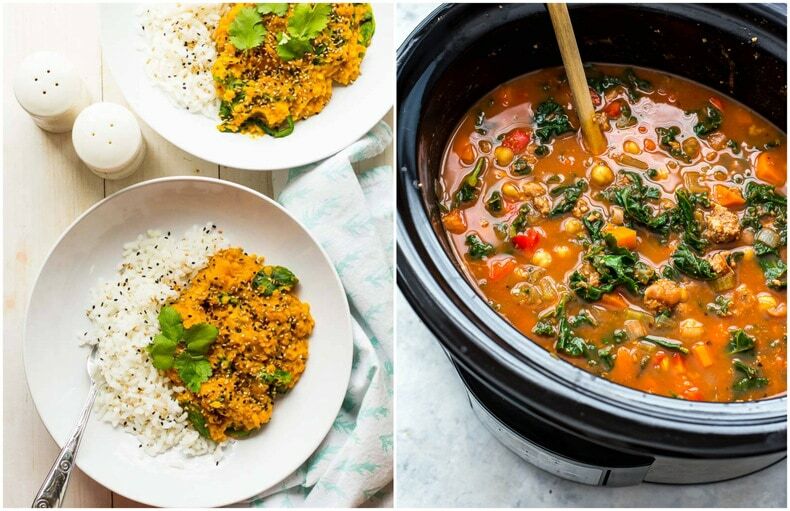 I also love that many Instant Pot recipes like the ones listed below allow you to dump dry rice, protein and liquid all at once so that you don't have to cook anything extra on the side. Worst comes to worst you can get rice going in a rice cooker while everything is pressure cooking but even that is hands-off and will save you SO much time! Check out these easy Instant Pot recipes for my last easy dinner idea tip. And there you have it – my full, comprehensive list of healthy dinner ideas! These are by far the easiest way to get dinner on the table and help you choose what to make even if you're not sure what you're craving. If you liked this list, be sure to pin the top image for later or share on Facebook to spread the word about just how easy dinner can really be! 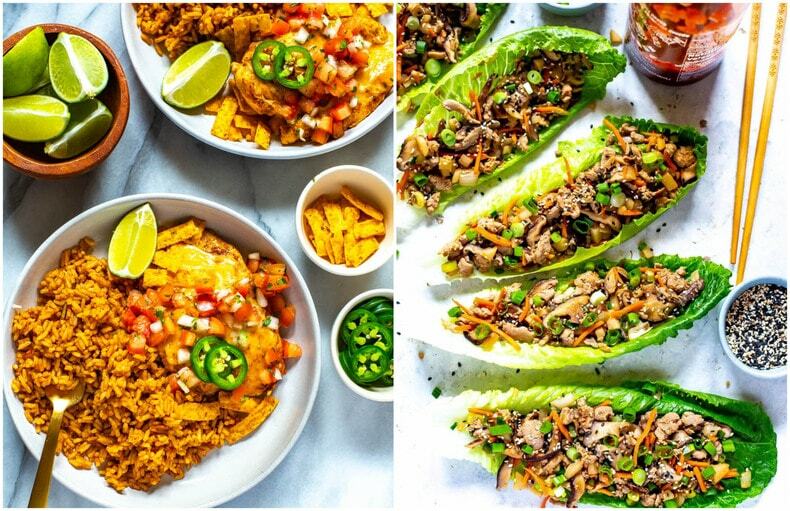 If you're looking for more awesome dinner ideas and ways to plan your meals check out these other websites below, they have a really great selection of meal prep ideas and great tips to get you started on dinner! And don't forget to sign up for my FREE 5-day meal prep challenge below if you'd like some more help with meal planning – it'll give you even more tips and tricks to prepare dinner in a flash!